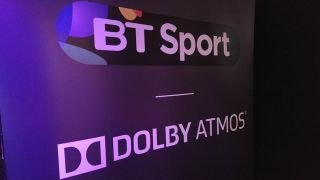 5 things we learned watching BT Sport Ultra HD with Dolby Atmos | What Hi-Fi? Ultra HD football broadcasts have kicked off in a big way since we first witnessed a 4K football match in the summer of 2015. BT Sport 4K UHD and rival channel Sky Ultra HD now deliver a wealth of Premier League games, as well as other sporting contests. In fact, according to BT Sport’s Chief Operating Officer, Jamie Hindhaugh, BT Sport has broadcast an impressive 71 live football fixtures in 4K since the season began last August. BT was the UK's first broadcast 4K TV channel and now, thanks to a partnership with Dolby, it has become the first broadcaster to deliver Dolby Atmos surround sound to subscribers of its top-tier Entertainment Ultra HD package. We were invited to watch the key clash in an exclusive installation at Belushi’s bar, London Bridge. The venue featured several 4K tellys, and a Pioneer SC-LX79 home cinema amplifier driving a KEF surround sound package that included its upward-firing R50 Atmos speaker modules. MORE: BT Sport Ultra HD: What is it? How can you get it? Capturing the sound is the key to putting the viewer right in the middle of the action, figuratively speaking. As Dolby Atmos surround sound technology is all about producing a more immersive ‘3D’ soundfield, extra microphones (12 in total) are dotted around the sidelines, capturing everything on and off the pitch, from the referee’s whistle to the crowd’s cheers and the sound of the ball being kicked. This ‘multidimensional’ sound was monitored and mixed in two outside broadcast trucks at Anfield stadium. Alongside the UHD images, the sound was processed and checked by BT facilities before the signal could be sent via BT’s Infinity fiber optic broadband to people’s homes. Just like being at Anfield? Not quite (for one, it was much warmer), but we’ve certainly not come across a more immersive football television presentation. The combination of 4K pictures and Dolby Atmos sound gives the peak home cinema experience when it comes to films – as select UHD Blu-rays have shown – so it’s no surprise that the two technologies also provide a top live football experience. A packed room with a few pillars as obstacles wasn’t perhaps the best environment for a comprehensive sonic scrutiny of Atmos, but it did deliver that ‘in-stadium’ feel. Crowd sounds were certainly more atmospheric – the pre-match rendition of You’ll Never Walk Alone was a fine advert for the technology – and noises from the touchlines came across loud and clear through the centre channel, even occasionally over the commentary. There was a sense that more people were in the room, and when the home team equalised, the uproar from the Anfield crowd was room-filling. Of course, football is a game of two halves, and the 4K picture didn’t let the side down either. It is a definite step up from HD broadcasts when it comes to stability and sharpness – and this was especially noticeable during close-ups. All in all, the audiovisual experience was more impressive than the 1-1 result. Even if the players themselves didn’t always deliver top quality football, the technology did. If you missed out on this occasion, not to worry – BT Sport has plans to ensure this is far from a one-off. In fact, every Premier League match broadcast live on the channel, as well as selected FA cup games and potentially Champions League matches too, will be available in Dolby Atmos sound. As Hindhaugh said: “TV viewers are used to having the best pictures when watching sports, but sound is often overlooked”. This is why BT Sport has set out to deliver the “best picture and best sound anywhere in the world for a live football match”, he added. So there are many broadcasts planned, but how viable is it? With budget 4K TVs starting from under £500, there is no longer the issue of accessibility or expense, however the must-have shopping list is still fairly long. To receive these BT Sport broadcasts, you'll need a BT Ultra HD set-top box, BT Infinity broadband and the Entertainment Ultra HD package… and for the Dolby Atmos experience, an Atmos-equipped AV receiver and speakers too. There’s plenty of the former across all price ranges, starting at the likes of the Denon AVR-X1300 (£300), but less choice when it comes to the latter. As Atmos is all about overhead sound, ceiling speakers are available from the likes of Monitor Audio, but if you don’t want holes in your ceiling, upward-firing modules like the KEFs and Pioneer S-BS73A-LR – both £600 a pair – and the Elac Debut A4 (£200 each) would be an alternative. Perhaps the most viable (but not necessarily most effective) option is an Atmos-equipped soundbar like the Yamaha YSP-5600 (£1600), Samsung HW-K850 (£900), Philips Fidelio SkyQuake (£900) and the imminent LG SJ9. Either way, it's still quite pricey at the moment. But as the content increases, in terms of both broadcasts and Ultra HD Blu-rays, the hardware will surely follow. It might just be some time before an Atmos set-up becomes ubiquitous. What's next for BT Sport and Dolby Atmos? So it’s good news for football fans, but as yet, there’s no word on the rest of BT Sport’s 4K portfolio - including Aviva Premiership Rugby, MotoGP and squash - being given the Dolby Atmos sound treatment. But if the Liverpool-Chelsea match is representative of the promising audiovisual partnership, any further sports in a 4K and Atmos presentation should be highly anticipated.